Sunshine and a few afternoon clouds. High around 80F. 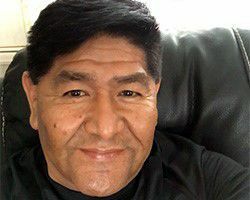 Winds S at 5 to 10 mph..
KETCHUM — The Sun Valley Center for the Arts will present a free lecture, “This Land is Home,” by Fort Hall Tribal Court Judge Leo Ariwite. The event will be at 6 p.m. April 25 at the center, 191 Fifth St. E., Ketchum. Ariwite was born and raised in Salmon and is a Northern Shoshoni, descended from the band of Sacajawea. His forebears, including Chief Tendoy, were forced to leave Salmon in 1907 and relocate to the Fort Hall Reservation. Ariwite will share stories of his homeland and how this land and its people were impacted by colonization. Reserve your seat in advance at web.ovationtix.com/trs/pe.c/10360581?mc_cid=fd5559651b&mc_eid=5dbfdf187a.